Proof. What does that mean? Orac writes a nice piece on the misconceptions of proof especially in regard to autism/antivaccination crowd. However, the below comment did strike me as slightly off. In the legal community the term "proof" used, but evidence is used at least as much if not more. Another thought that rant through my mind is that this was clearly not a scientist of any sort speaking. In science, in general, we don't speak of "proof." We speak of evidence and experimentation. Lawyers speak of proof, as in "proof beyond a reasonable doubt." Scientists speak of evidence in shades of gray, because most evidence is on a continuum. Besides, the article asked the question, "Has 'science based medicine' proven vaccine-induced autism doesn't exist?" The finder of fact in a trial is asked to weigh the evidence. This act of consider the evidence as a whole I would argue reflects that there are shades of gray noticed within the law as well. Otherwise, I think Orac has banged out another fine piece. Weight loss: No simple solution, still. Dr. Novella posted a nice piece that despite all the various fad diets that promise weight loss due to metabolic changes, and not so much on caloric intake, does not hold up to scrutiny. The evidence does show that high protein, low carb diets (and probably it’s the protein and not the carbohydrates) do reduce hunger over the short term (3-6 months), but this advantage appears to be very modest and goes away after 6 months. I had a discussion today at work with a person who has recently embarked upon the Atkins Diet, and she lamented upon not yet entering upon ketosis so her weight loss could begin. I pointed out that recent and not so recent studies point to it still basically being calories in and calories out, and when all you do is eat protein in the end you're taking in less calories. I received that party pooper look I often get, and didn't push it. Too bad this person does not follow Science Based Medicine blog, et al. Brian Thompson announces an end to his long running Amateur Scientist Podcast. Although as with all things as this door closes another opens. Mr. Thompson, now of California, explains during a brief announcement what the next door promises to reveal. How the Titanic could have totally changed my local history. Milton Hershey, the chocolate magnate who started Hershey Chocolate and built the town that SkepReview HQ is located, nearly went down on the RMS Titanic. Luckily, Uncle Milt decided not to go on that terrible voyage. Due to pressing business concerns, Hershey ultimately took passage a few days earlier on the German liner Amerika, arriving safely in New York City days before Titanic sank. His ailing wife, Catherine, remained in Europe. 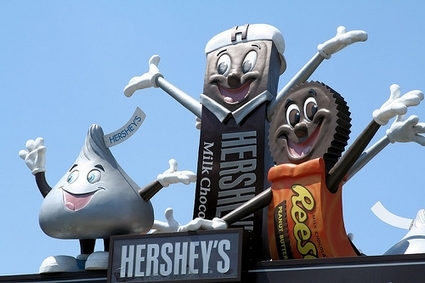 After Hershey returned from Europe, and back to his Chocolate Factory, he pushed ahead with a private school for disadvantage boys, built an amusement park, came out with the Hershey Kiss, sold chocolate to and then purchased and distributed Reese's Peanut Butter Cups, and part of his fortune was used in the 1960's to start a Medical College, and research hospital. Sure if he had died things might have even turned out better for this small sleepy Central Pennsylvania village, but somehow I really doubt it. Bruce Springstein and Broadway Road shows make tour stops in this village of 12,000ish. Not bad really.